Viral Mythology presents an overview of the various ways that esoteric information and ancient wisdom has been passed down to us. These days, practically everything is available to us through our favourite search engine, so perhaps it's fair to say that we take rather a lot for granted in terms of access to information, and the belief systems that swirl around received wisdom. It's a timely reminder to think about how perilous and complex the dissemination of heretical ideas once was during less enlightened times, and to consider how the powers-that-be sought to spread their teachings as widely and assertively as possible. Both made wide use of myth and legend, and promulgated those ideas through oral tradition, writing, art and monumental design. Naturally, the transmission of information down the line takes the form of leaving an imprint on the culture or environment which guides the next generations. Art, texts, monuments, and so on. Then there's the oral tradition route, which is central to the dissemination of mythology, and promulgation of religious doctrine. From there, the authors explore other myth themes: the dying-and-rising god, Joseph Campbell's Hero's Journey monomyth (which can be seen as a running theme in many modern blockbuster epics of the silver screen). So far so interesting but, like I said, the book presented me with a now familiar pattern. It's hard to tell where this book started to drift, but it was probably around about this point. In keeping with some of their previous outings, the authors could be reasonably accused of information-dumping in the second half. The book begins to meander across several themes - American folk-lore, anomalous historical artifacts, secret societies, and even arguments about ancient aliens. All of these themes are of keen interest to their readers, I'm sure, but it was less clear to me what the argument was that they were building with these examples, beyond "things might just be more complicated than you think!" This sense of drift might be partly due to the way the authors present their material - in a fairly journalistic, quasi-academic manner. They seem to take particular pride in remaining non-partisan in any particular debate. That's fine for print journalism, but lacks conviction when it comes to the presentation of a particular thesis, which I imagine is what a reader might expect from a book such as this. Personally, I tend to appreciate complexity and an agnostic stance on many issues, so I have some sympathy for the authors' general approach to understanding the world, but I also like to be able to get to grips with a solid argument as well. I didn't really understand what the thread was that I was supposed to be considering. I would stab a guess that they perhaps favour some Jungian-style solution to the seemingly viral spread of information across Humanity, or at least a psychological theory that explains why some ideas accord so well with so many people when others go by the wayside. But I couldn't quite grasp what the authors were really wanting me to take away from the book, particularly as I moved through the extensive zone of commentary at the end. Which, given the theme of the book, struck me as rather ironic. Nevertheless, I enjoyed the journey, even if the destination was unclear. The authors are well read and present their material in an engaging, concise manner. And if there was more commentary than solutions, then that's perhaps because the answer to the riddle of how some ideas take such a hold on us humans is one that still eludes us. 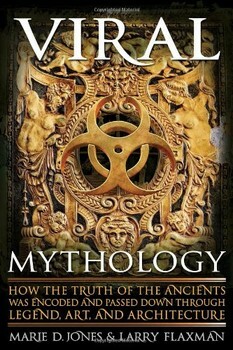 Subtitled "How the Truth of the Ancients was Encoded and Passed Down Through Legend, Art, and Architecture"